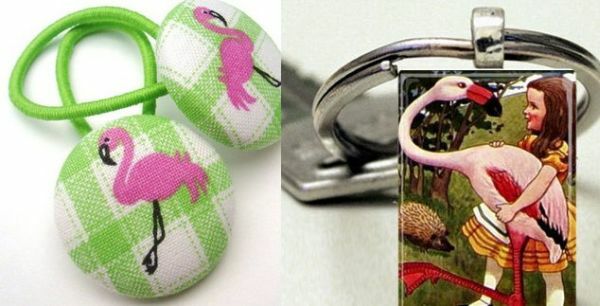 Well this is weird – I’m not a huge fan of the colour pink and I have a bird phobia but I love flamingos. I’m not sure if it’s because I’m in the middle of a flamingos-used-as-Miami-Art-Deco-motifs love affair or if it’s because they keep popping up in the plethora of Alice in Wonderland-inspired designs but I’m seeing pink at every turn. 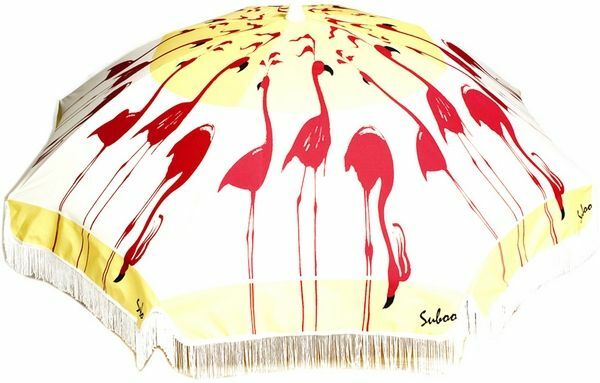 Apart from Miami and Alice flamingo references, other flamingos have caught my eye – Lorna Freytag’s stunning portrait (shown at top), the gorgeous old birds we saw at Adelaide Zoo and the Suboo beach umbrella that has been on my wish list ever since I spotted it last summer. But what’s out there for kids? 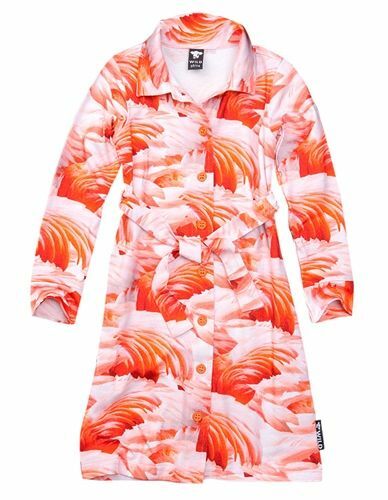 Think flamingo-inspired clothing and you might expect pink, pink, pink. Fear not, a number of major labels have used flamingos as a design feature without a pink overload. 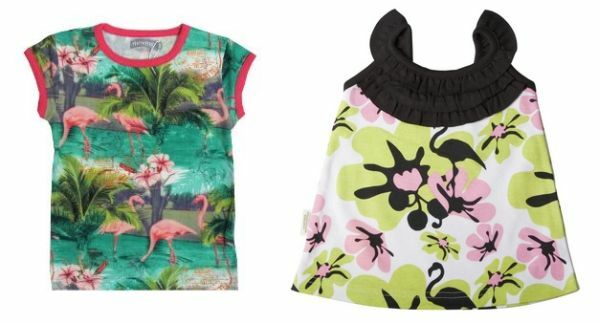 Spotted over summer were seriously fabulous retro flamingos from Minymo, funky flamingo silhouettes by SookiBaby (shown above right) and Littlehorn’s summery Road Trip print. (Lots of online boutiques still have these pieces available). For winter, check out Ida T’s deep plum flamingo print baby wear and the stunning girl’s dress by Wild Kidswear (below). 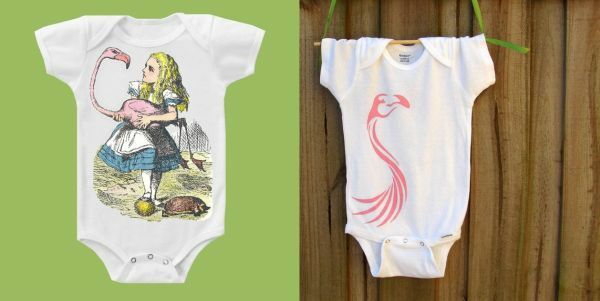 For babies, you’ll find lots of flamingo onesies on Etsy – I like ChiTown Boutique’s Alice with Flamingo design, the stylised flamingo by Morning Star Loft (who informs us that in Florida, baby girls are delivered by flamingo, not the stork!) 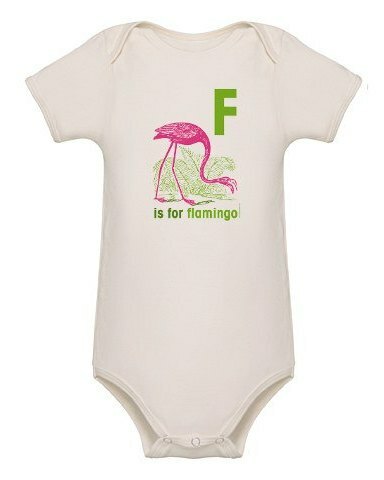 and the ‘F is for Flamingo’ onesie by PFDforKIDS (also available as a t-shirt for older children). Top the onesie off with a knit hat from Etsy’s My Miniature Knits and Zazzle shoes featuring Danish artist Asbjorn Lonvig’s Carnival at the Zoo flamingo print. Flamingos create the perfect pink decorating theme for girls bedrooms. 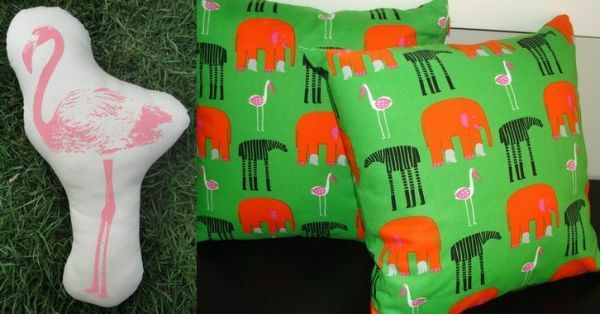 Check out gorgeous fabrics from Spoonflower, the screen-printed cushion from Etsy seller Cactus & Cottontail and the bright lime and orange cushion from Hanna’s Boutique, good for a boy or a girl. I didn’t expect such a choice of flamingo wall decals but there are actually a few available and the pink birds look great against bright walls. 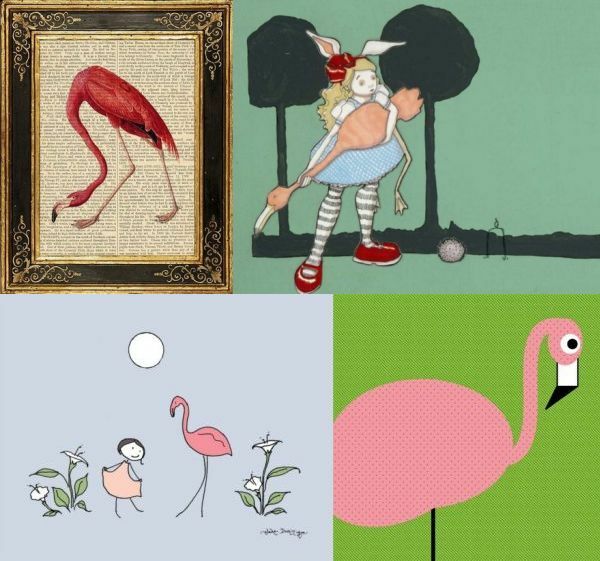 I like the superb photo-realistic bird from Solana Graphic Studio and the bold flamingos from Planet Wall Art (above). 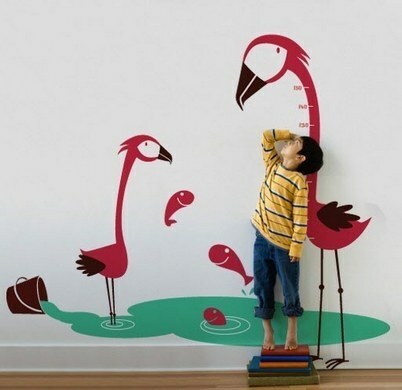 For a child’s room, NouWall’s Flamingos & Fishes decal which incorporates a growth chart is good fun (below). Likewise prints and artwork – there are oodles available and I’ve picked a handful to show different styles. 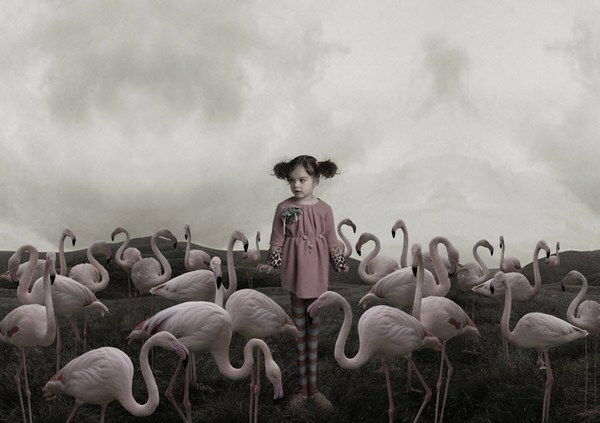 Make a dramatic statement with a vintage book print from Dreamery Studio or choose something Alice-inspired by JK Lee, a modern flamingo by Man vs George or a picture-perfect nursery piece by Stick Nymph (below). 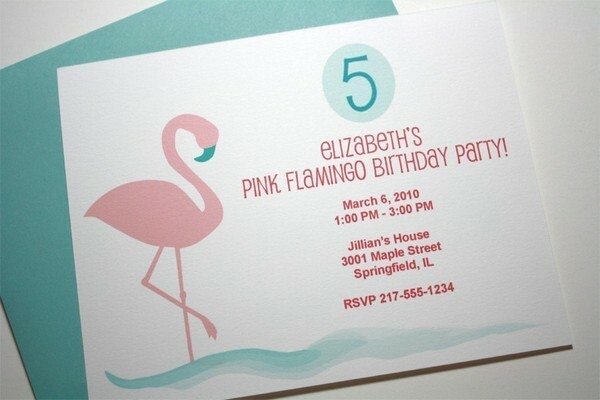 Feel like a flamingo-themed party? Perth-based company Flamingos for Celebrations (yes, really) will cover your garden with pretty pink birds for your special occasion. 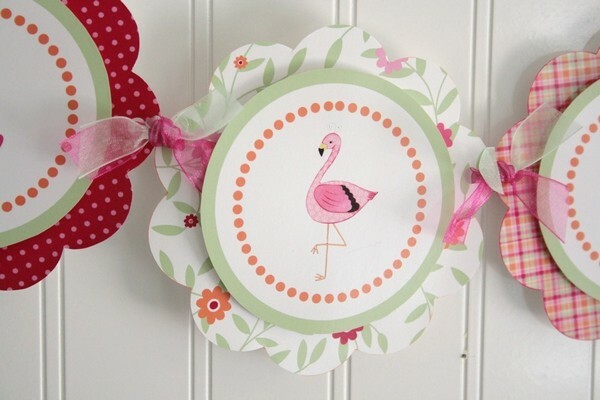 Add printable flamingo bunting from M.Bradley Designs, divine invitations from Dots and Dahlias and flamingo party favours – everything from vintage-inspired key rings, crayons and hair accessories and I’m fairly sure you’ll have a party theme that no one at kinder has done before. 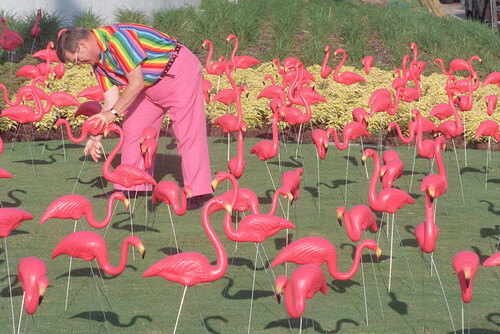 It wouldn’t be a comprehensive review if I didn’t include a mention of flamingos used as garden ornaments. 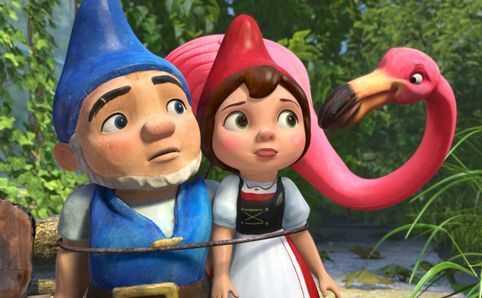 The ultimate in kitsch, flamingos add a certain touch of retro glamour to the garden pond – certainly the recent movie Gnomeo & Juliet put flamingos back in vogue. Want one for your garden? Check out ebay for lots of designs, including these traditional plastic garden flamingos. 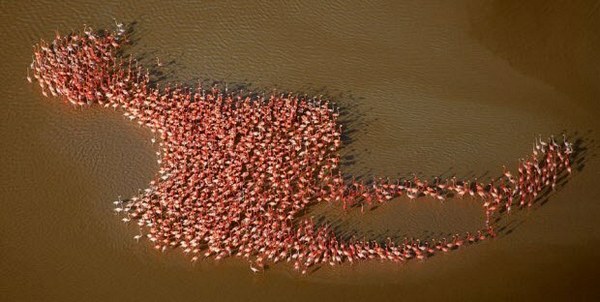 While busying myself with flamingo-related research (don’t I have a lovely job?! ), I came across this truly incredible photograph of a flock of flamingos by National Geographic photographer, Robert B. Haas. Isn’t nature amazing?